Oakland Raiders coach Jack Del Rio said that Marshall Newhouse is the current starter at right tackle. Newhouse played 524 snaps for the Giants last season at both guard and tackle and is coming off his highest-graded season in the NFL at 69.4, 46th among OTs. Based on his 2016 performance, Newhouse shouldn’t be a major liability in pass protection at right tackle. His pass-blocking grade of 75.1 ranked 37th among eligible tackles and his pass-blocking efficiency of 96.5 ranked 13th (min. 90 snaps in pass protection). 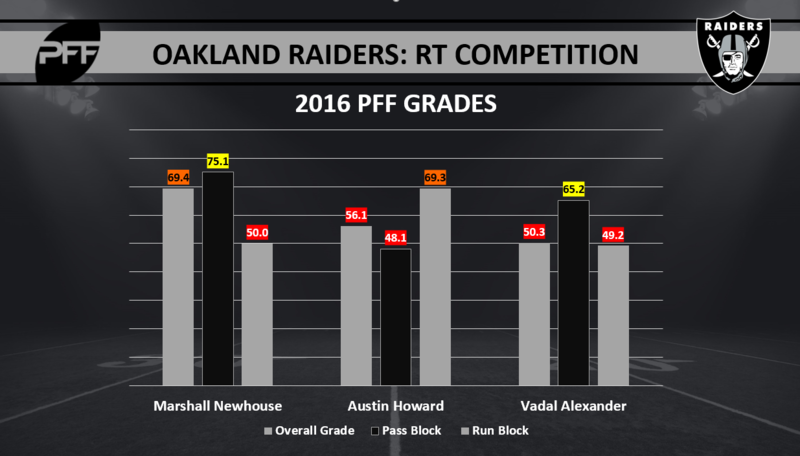 Newhouse struggled as a run-blocker in 2016, earning a “poor” run-block grade of 50.0, which ranked 60th out of 79 tackles.